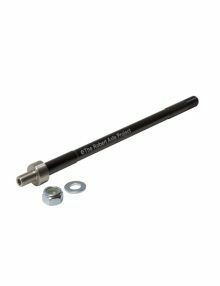 The true length of the axle shaft is 172 mm, but can be shortened using the included spacers – a flat 5 mm spacer and a tapered 5 mm X-12 spacer. This allows for axle lengths of 162, 167, or 172 mm. Please note: Thru-axle lengths do not equal hub standards. An axle has to be longer than the hub to fit in the frame. A 12×142(+) hub does not equal a 142mm long axle. 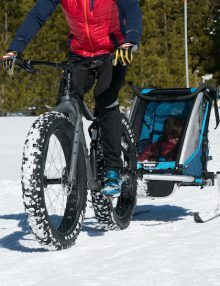 Until I found this product, I was going to purchase a mtb I didn’t really like as much as the Specialized Camber 29er becuase I needed the ability pull my child trailer. This thru axle fit perfectly and felt sturdier than the original. Awesome! Works on my Santa Cruz perfectly. Now I can go have fun on the single tracks and come back, put on the trailer and go out with my wife and daughter on the same bike! It rules!!! Great product! Really well made and works perfectly with my mountain bike. No need to bring a separate bike to tow the trailer anymore. The axle fit perfectly on my Santa Cruz blur. Seems to be very strong. I’m able to hook up and disconnect my baby trailer without swapping axles. Just leave the Robert axle in and hit the trails after pulling my kid around town. This is a great solution for the over size thru axle problem for hooking up attachments. I spent a long time trying to figure out a way to hook up a trailer to my mtb’s, I’m super stoked to have finally found something like this. Thank you guys. This worked great for my bike. 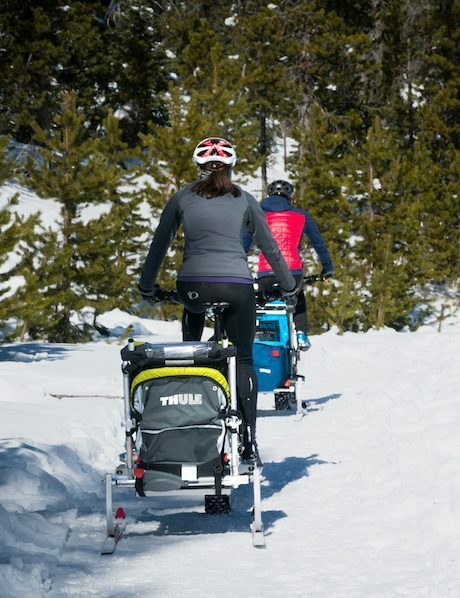 Very easy to install and use with a Thule Chariot Cougar. Just be careful to not overtighten, as it could be difficult to remove. I swap back to my stock axle for actual mountain bike rides. This worked great for my e-bike. It’s easy to install. I use it with my crooser chariot. Now I can travel with my daughter!! I have a stump jumper soft tail that I love to ride but found myself taking my less desired backup bike to pull my youngest around in until I found this axle. It’s awesome I have found it mounts to literally every child trailer I have ever seen. Great product very well made, and shipping was fast. Thank you guys for making a great product. 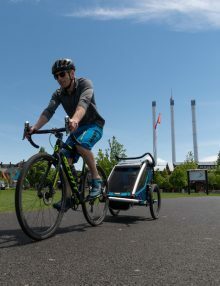 Ordered this item for my wife’s new bike so she can tow our son to the park in the Burley Honey Bee trailer. Works and fits perfectly for this application with absolutely no issues. So glad I found Robert Axle Project. It saved us from buying a separate bike just to tow our son. Now she can enjoy an awesome bike for trail riding, AND tow our son for leisurely rides on the bike path on the same bike. Great product! Amazing product and the engineering and design is fantastic quality! I ordered the wrong axle and the support team immediately helped me figure out the correct one and shipped it to me the next day. Installation was super easy and pulling my new Bob Trailer was so smooth and easy. Started training with the trailer for my first wilderness trek with a trailer and I have to say that every ride has been so smooth and solid thanks to this product! Well done guys and you have a fan for life! Glad I found this online and thank you for designing and manufacturing this much needed product! I tow my disabled adult son in a large special needs trailer. I now use my electric bike with this hitch mount thru-axle and know that the mount will hold up to the load. With over 80kg in tow, I now feel confident in the strength and quality of this product. Works like a charm on my 2014 Stevens Jura Mountainbike. My son loves it to get to the Kindergarden by bike with his dad. Thanks for making this possible. That’s what we like to hear – biking to kindergarten. Thanks for sharing! Amazing product, fits perfectly on my Santa Cruz 5010. 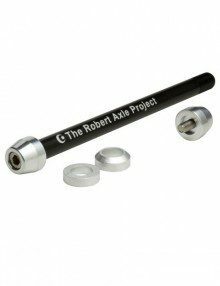 I spent along time researching an axle that would work with my bike and thankfully The Robert Axle Project had one. Shipping was quick, even to Canada. I can now pull my son in his Thule bike trailer and I’m considering just leaving it in at all times so we can pull him whenever we want. Axle is great. I had modifications made to my old trailer bracket but it did involve cosmetic damage to my frame. This one is super easy to mount, it’s very rigid, stays in place, and easy to switch around with other bikes. 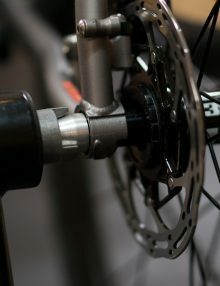 The through axle was very easy to install on my Specialized Rumor and my husband’s Specialized Epic. We tow our Border Collie puppy to the park in his Burley Tail Wagon for some extra playtime. Makes for a very happy puppy! Now I have the ability to pull this trailer with every bike I own. Thank you for developing a product that meets our needs! 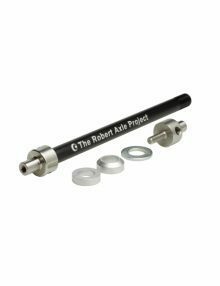 Have to say that the customer service from Chris at Robert Axle has been fantastic. Really helped out with an issue that I had, and made buying from the UK very easy. 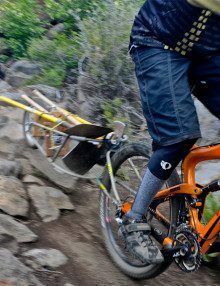 Application: 2016 YT Industries Capra pulling a 2016 Burley Bee. Website was very easy to navigate through for selecting the correct axle for my bike and trailer. Simply pick your bike and what trailer you’re using and it pops up. Installation was very easy and the product is very well made. I got a quick reply on the verification of the axel type :: so that was cool. This axel is so awesome! We were able to haul our kids up a snowy road and hike into some Hot Pots in the Winter… blew our minds how this simple tool made it all possible to do such a grand trip with our kiddos in tow. Thank you! 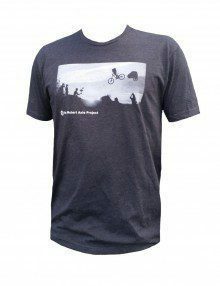 Great product fitting perfectly my Stumpjumper, I received it faster than expected. I will highly recommend this product. Totally seamless fit between a Burley D’Lite and a Specialized. Happy with the entire buying experience and really thankful that the RAP is out there making these axles so that I can keep using my trailer with my new bike. Just installed this after having it delivered from Germany to Sweden! Works perfectly! Top notch product. Now we can resume the daily dargis (daycare) drop off. Except now it’s behind my new specialised turbo Levo, so are doing it in half the time! I was so happy to find y’all’s axles. First time ordering I wasn’t sure I got the right size. The fit guide helped get the right axles for us (one for my wife, one for me). 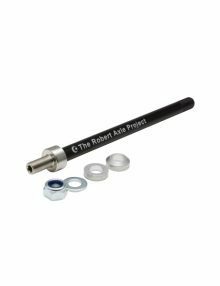 The axles are robust and well designed to fit a range of lengths, so clever. Y’all thought of everything. Five stars for y’all’s customer service too, you responded to my issue so fast and very kindly. My son loves going for rides now, and I am confident he’s safely in tow. Thank you. Worked on my 2016 Specialized FUSE! Kiddo loved Bar Harbor carriage trails. The axle fit perfectly and arrived super fast! Thanks for making this my family is very appreciative! This fits my 2012 Stumpjumper FSR perfectly. I would even say better than the original DT Swiss Through Axle. This is a perfect solution for what seemed to be an unsolvable problem; even my LBS told me there was no way to attach a trailer to my bike. 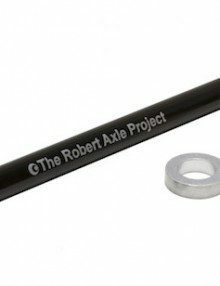 Shipping was lightning quick and the support videos are comprehensive with installation instructions; follow the initial installation instructions, and it’s really easy to switch back and forth.The axle is really well made and exceptionally engineered. They’ve done an excellent job at designing such a simple, yet elegant solution. 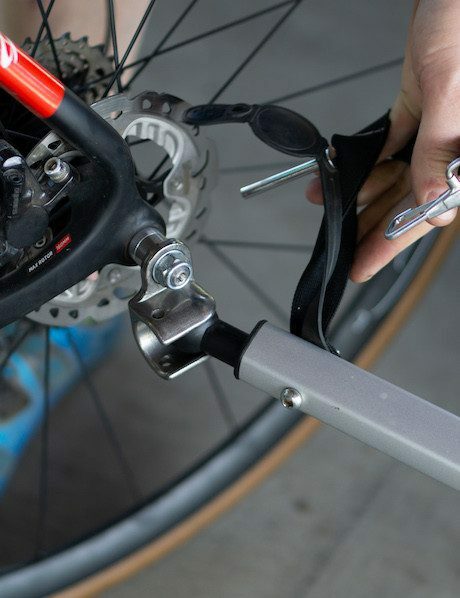 My local bike shop recommended this part and it works as advertised. The sizing chart was spot on, installed with easy to follow instructions (I loath returning internet purchases that don’t work). Pulling a Burley kid trailer with a Specialized 29er and as a new parent I’m discovering a whole new world of gadgets. Would love to see your product at bike expos and local bike events — quality axel and user friendly website. great product that works with my Chariott and nice thing is with the included allow spacer it fits both my wifes Intense that is 142×12 and my boost bike. Know not case in all but this is great that the boost to non-boost spacer is included. Made our day and little one loves it! Very pleasantly surprised how seamlessly this worked with my bike. 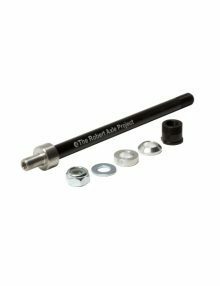 I had a difficult time finding a thru axle for my mountain bike. But this one slipped right in and my little boy and I were on our way in no time. Very happy with the purchase. Product far better than described and service is just simply first class! Easy to fit and once on its super easy to remove and use the original when not towing. The 12mm thru axle works perfectly on my Stumpjumper. It allows me to pull a Burley cargo trailer with no problems! Works perfectly on my Specialized Epic. Great job guys! High quality product, easy to identify correct axle, quick support for any questions, and fast delivery. 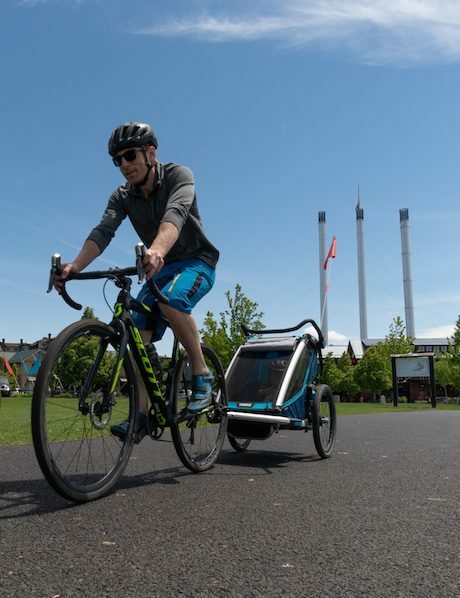 Awesome to be able to pull a trailer with a Specialized Turbo pedal assist bike! Well done Robert Axle Project. Thank you for sending the axle quickly which arrived with good instructions and well packed. The axle is perfect for the trailer that tow behind my e-bike. So happy to have found this resource. 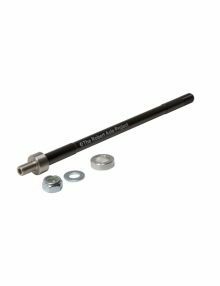 Super easy to indentify the correct axle and fast shipping. The product works perfectly. It is an excellent quality shaft, it is perfect for my bike, Specilized Turbo Levo. The shipment was fast, I live in Spain. I definitely recommend it. Perfect fit, high-quality product with amazing post-purchase support! Purchased for my Specialized Fuse Comp 2018. Quick and easy install, works great with my Burly Bee. Axle is well made and instills confidence when you can compare it to the bikes existing axle. I have zero complaints and zero worries that I’d have any issues with this axle. Bought this for mye Specialized Turbo Vado 3.0. It fits very well. Awesome product and delivery time. This is was a lucky find and an excellent piece of hardware. I haven’t bought a new bike in nearly fifteen years so the through-axle was something I had only seen on downhill bikes and was bummed when I realized my hand-me-down kid trailer wouldn’t attach. This is the missing piece we needed. It works well and feels super stable on my Specialized Sequoia. Fits great, easy to install (hold the axle with the allen while you tighten on the trailer yoke). Allows me to bring one bike on bike trips which is sweet because it is my only trick to get the baby to nap. Works fine – no problems fitting the axle – The trailer fits and have traveled over 200 miles since installing it three weeks ago. Can not speak highly enough of the service and the product. Fully recommend. Great product, very well made and fits perfectly. Excellent communication and very efficient service, it was delivered to me in NZ in less than 4 days!